German rabbi; son of Solomon Plessner; born Feb. 19, 1841, at Berlin; died at Ostrowo March 30, 1898. He studied at the University of Berlin, and received his degree as Ph.D. from the University of Tübingen (1870). In 1871 he was appointed "Stiftsrabbiner" at Hanover, and was called April 20, 1873, to the old community of Rogasen as successor to Moses Feilchenfeld. In Sept., 1885, he was called to Ostrowo as successor to the late I. M. Freimann, remaining there until his death. 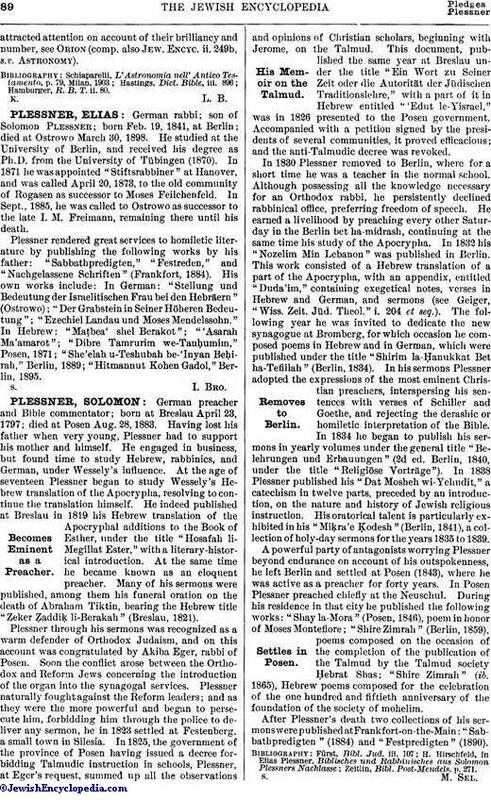 Plessner rendered great services to homiletic literature by publishing the following works by his father: "Sabbathpredigten," "Festreden," and "Nachgelassene Schriften" (Frankfort, 1884). His own works include: In German: "Stellung und Bedeutung der Israelitischen Frau bei den Hebräern" (Ostrowo); "Der Grabstein in Seiner Höheren Bedeutung"; "Ezechiel Landau und Moses Mendelssohn." In Hebrew: "Maṭbea' shel Berakot"; "'Asarah Ma'amarot"; "Dibre Tamrurim we-Tanḥumim," Posen, 1871; "She'elah u-Teshubah be-'Inyan Beḥirah," Berlin, 1889; "Hitmannut Kohen Gadol," Berlin, 1895.